They assumed this would take place district by district. That plan was carried out by many states until the 1880s. For example, in Massachusetts in 1820, the rule stated "the people shall vote by ballot, on which shall be designated who is voted for as an Elector for the district." In other words, the people did not place the name of a candidate for a president on the ballot, instead they voted for their local elector, whom they trusted later to cast a responsible vote for president. Federal law ( 2 U.S.C. § 6) implements Section 2's mandate. After the vote, each state then sends a certified record of their electoral votes to Congress. The votes of the electors are opened during a joint session of Congress, held in the first week of January, and read aloud by the incumbent vice president, acting in his capacity as President of the Senate. If any person received an absolute majority of electoral votes that person is declared the winner. If there is a tie, or if no candidate for either or both offices receives a majority, then choice falls to Congress in a procedure known as contingent election. Even though the aggregate national popular vote is calculated by state officials, media organizations, and the Federal Election Commission, the people only indirectly elect the president, as the national popular vote is not the basis for electing the president or vice president. The president and vice president of the United States are elected by the Electoral College, which consists of 538 electors from the fifty states and Washington, D.C. Electors are selected on a state-by-state basis, as determined by the laws of each state. Since the election of 1824,  most states have appointed their electors on a winner-take-all basis, based on the statewide popular vote on Election Day. Maine and Nebraska are the only two current exceptions, as both states use the congressional district method. Although ballots list the names of the presidential and vice presidential candidates (who run on a ticket), voters actually choose electors when they vote for president and vice president. These presidential electors in turn cast electoral votes for those two offices. Electors usually pledge to vote for their party's nominee, but some " faithless electors" have voted for other candidates or refrained from voting. Currently, there are 538 electors; based on 435 representatives, 100 senators, and three electors allocated to Washington, D.C. The six states with the most electors are California (55), Texas (38), New York (29), Florida (29), Illinois (20), and Pennsylvania (20). The seven least populous states— Alaska, Delaware, Montana, North Dakota, South Dakota, Vermont, and Wyoming—have three electors each. This is because each of these states has one representative and two senators. Article II, Section 1, Clause 2 of the Constitution requires each state legislature to determine how electors for the state are to be chosen, but it disqualifies any person holding a federal office, either elected or appointed, from being an elector. 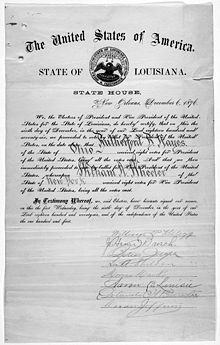 Under Section 3 of the Fourteenth Amendment, any person who has sworn an oath to support the United States Constitution in order to hold either a state or federal office, and later rebelled against the United States directly or by giving assistance to those doing so, is disqualified from being an elector. However, the Congress may remove this disqualification by a two-thirds vote in each House. An elector may vote for anyone for each office provided that at least one of their votes (president or vice president) is for a person who is not a resident of the same state as that elector. But "faithless electors" are those who either cast electoral votes for someone other than the candidate of the party that they pledged to vote for or who abstain. Twenty-nine states plus the District of Columbia have passed laws to punish faithless electors, although none have ever been enforced. Many constitutional scholars claim that state restrictions would be struck down if challenged based on Article II and the Twelfth Amendment. In 1952, the constitutionality of state pledge laws was brought before the Supreme Court in Ray v. Blair, 343 U.S. 214 (1952). The Twelfth Amendment mandates Congress assemble in joint session to count the electoral votes and declare the winners of the election. The session is ordinarily required to take place on January 6 in the calendar year immediately following the meetings of the presidential electors. Since the Twentieth Amendment, the newly elected Congress declares the winner of the election; all elections before 1936 were determined by the outgoing House. The Office of the Federal Register is charged with administering the Electoral College. The meeting is held at 1 p.m. in the Chamber of the U.S. House of Representatives. The sitting vice president is expected to preside, but in several cases the president pro tempore of the Senate has chaired the proceedings. The vice president and the Speaker of the House sit at the podium, with the vice president in the seat of the Speaker of the House. Senate pages bring in the two mahogany boxes containing each state's certified vote and place them on tables in front of the senators and representatives. Each house appoints two tellers to count the vote (normally one member of each political party). Relevant portions of the certificate of vote are read for each state, in alphabetical order. Opponents of the Electoral College claim such outcomes do not logically follow the normative concept of how a democratic system should function. One view is the Electoral College violates the principle of political equality, since presidential elections are not decided by the one-person one-vote principle. Outcomes of this sort are attributable to the federal nature of the system. Supporters of the Electoral College argue candidates must build a popular base that is geographically broader and more diverse in voter interests than either a simple national plurality or majority. Neither is this feature attributable to having intermediate elections of presidents, caused instead by the winner-takes-all method of allocating each state's slate of electors. Allocation of electors in proportion to the state's popular vote could reduce this effect. Elections where the winning candidate loses the national popular vote typically result when the winner builds the requisite configuration of states (and thus captures their electoral votes) by small margins, but the losing candidate secures large voter margins in the remaining states. In this case, the very large margins secured by the losing candidate in the other states would aggregate to a plurality of the ballots cast nationally. However, commentators question the legitimacy of this national popular vote. They point out that the national popular vote observed under the Electoral College system does not reflect the popular vote observed under a National Popular Vote system, as each electoral institution produces different incentives for, and strategy choices by, presidential campaigns. Because the national popular vote is irrelevant under the electoral college system, it is generally presumed that candidates base their campaign strategies around the existence of the Electoral College; any close race has candidates campaigning to maximize electoral votes by focusing their get-out-the-vote efforts in crucially needed swing states and not attempting to maximize national popular vote totals by using finite campaign resources to run up margins or close up gaps in states considered "safe" for themselves or their opponents, respectively. Conversely, the institutional structure of a national popular vote system would encourage candidates to pursue voter turnout wherever votes could be found, even in "safe" states they are already expected to win, and in "safe" states they have no hope of winning. Each state gets a minimum of three electoral votes, regardless of population, which gives low-population states a disproportionate number of electors per capita. For example, an electoral vote represents nearly four times as many people in California as in Wyoming. Sparsely populated states are likely to be increasingly overrepresented in the electoral college over time, because Americans are increasingly moving to big cities and because cities are growing especially in the biggest states. This analysis gives a strong advantage to the smallest states, but ignores any extra influence that comes from larger states' ability to deliver their votes as a single bloc. Supporters of the Electoral College have provided many counterarguments to the charges that it defended slavery. Abraham Lincoln, the president who helped abolish slavery, won an Electoral College majority in 1860 despite winning less than 40 percent of the national popular vote. Lincoln's 39.8%, however, represented a plurality of a popular vote that was divided among 4 major candidates. Thus he did indeed win the popular vote. On September 8, 1970, the Senate commenced openly debating the proposal  and the proposal was quickly filibustered. The lead objectors to the proposal were mostly Southern senators and conservatives from small states, both Democrats and Republicans, who argued abolishing the Electoral College would reduce their states' political influence. On September 17, 1970, a motion for cloture, which would have ended the filibuster, received 54 votes to 36 for cloture,  failing to receive the then required a two-thirds majority of senators voting. A second motion for cloture on September 29, 1970, also failed, by 53 to 34. Thereafter, the Senate majority leader, Mike Mansfield of Montana, moved to lay the proposal aside so the Senate could attend to other business. However, the proposal was never considered again and died when the 91st Congress ended on January 3, 1971. Several states plus the District of Columbia have joined the National Popular Vote Interstate Compact. Those jurisdictions joining the compact agree to eventually pledge their electors to the winner of the national popular vote. The compact will not go into effect until the number of states agreeing to the compact form a majority (at least 270) of all electors, thus guaranteeing that the popular vote winner will be elected. The compact is based on the current rule in Article II, Section 1, Clause 2 of the Constitution, which gives each state legislature the plenary power to determine how it chooses its electors. Some scholars have suggested that Article I, Section 10, Clause 3 of the Constitution requires congressional consent before the compact could be enforceable;  thus, any attempted implementation of the compact without congressional consent could face court challenges to its constitutionality. ^ a b c d Kolodny, Robin (1996). "The Several Elections of 1824". Congress & the Presidency. 23 (2): 139–64. doi: 10.1080/07343469609507834. ^ Gelman, Andrew; Katz, Jonathan; Tuerlinckx, Francis (2002). "The Mathematics and Statistics of Voting Power" (PDF). Statistical Science. 17 (4): 420–@35. doi: 10.1214/ss/1049993201.